Firefighters have tackled a fire at a hotel in central London. 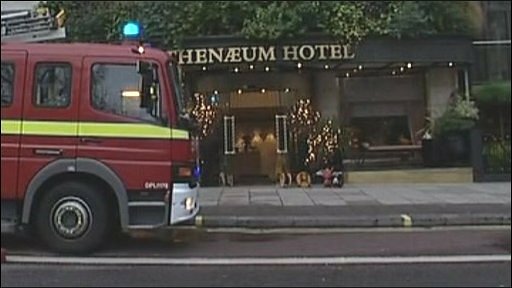 About 30 attended the scene after being called to the Athenaeum, in Mayfair, west London, around 0730 GMT. The blaze was under control three hours later. It is believed that at one point around a quarter of the basement had been alight, although the cause is unknown. The 10-storey building was evacuated. The hotel's website calls it a "small family-owned 5 star hotel in Mayfair, London with a big personality". A London Fire Brigade spokesman said: "The cause is under investigation. Crews acted quickly and stopped the fire from spreading further, and the damage was kept to the basement."